I think it goes without saying that in the ALL/Descendents camp, ALL will always be the more underappreciated group. It’s strange to think that, out of the two, the band that’s considered the part-time project (Descendents) will always get all the glory. Not that ALL has had a stronger musical output, mind you (though after the Descendents’ Hypercaffium Spazzinate that gap might be closing in), but the fact remains that when the cards are down, ALL has undoubtedly put out some amazing albums. In their long and tumultuous career, probably no album sticks out more than Pummel. I speak knowing full well just how odd and goofy Percolator is. And while Percolator still feels like a band at the wheel, Pummel sounds more like a band being swept away in the chaos it’s in. As Keith Morris said, the mid-90s was a major cash grab for punk rock as major labels were throwing money at punk bands in order to cash in on the craze. ALL got swept up in this craze and signed with Interscope. They would stay with the label for only one album (ALL, after all, was not as marketable as Green Day or Rancid) but there would be many first along the way. ALL used the money they got from Interscope to build their recording studio The Blasting Room, which they’ve claimed is the best investment they’ve probably ever made. This was ALL recording their own album in their own studio for the first time, living in separate spaces for the first time. Pummel is also the thrashiest and (personally) the best the band has ever sounded sonically: it’s loud and not too polished. With the release of Pummel, ALL found themselves shooting videos, and performing on national television for the first time, but Interscope simply didn’t know how to promote the band. Or maybe Pummel was the wrong album to push on a new audience. There’s unquestionably some magic there (like Million Bucks, Miranda, and Black Sky), but it’s also their darkest and most aggressive album. Also, there are some songs that might be just plain tone deaf, like Stalker and Hetero. 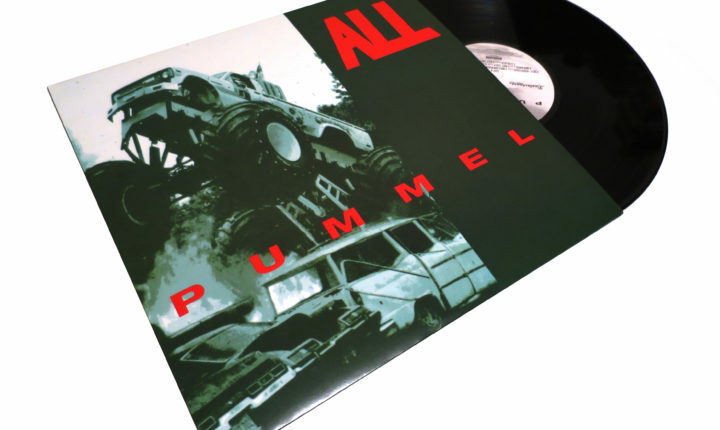 In the end, Pummel is just an unfocused record and arguably not the band at their strongest. They give it a shot, and unfortunately didn’t hit their mark. For years, this was THE find of ALL vinyl records and would easily set you back $100 on eBay, but the Porterhouse guys have done us all a favor and reissued this record for us. It’s on heavy 180g black vinyl, with insert and a beautiful sight to behold. Pummel has its fanbase, and as of late ALL is getting a resurgence of sorts (though the Descendents reactivation might put a damper on things), so we just might start talking about Pummel again and reassessing it as listeners. It’s funny, sad, scary, and odd all at once. It’s the full package and worth every penny.